Our Gospel lection today tells of Jesus defying the laws of physics by walking on water. This story has fascinated people for centuries. Three Gospels record it: Matthew, Mark, and Luke. Today we’ll look at the account in Matthew 14:22-33. There are folks who try to discount or even get rid of Jesus’ miracles to make the Bible more palatable to modern sensibilities. They say the feeding of the 5,000 (Matt. 14:15-21) was merely a miracle of sharing. They say the exorcisms performed by Jesus were merely the way he approached mental illness—giving those who suffered counseling then restoring them to community, thus healing them. They say other miracles of healing are merely about Jesus being a great person who people looked to for strength and comfort, thus getting better. Well Jesus was a great, charismatic person—he did many things that were marvelous, yet not miraculous. However, Matthew and the other Gospel writers were not apologetic about Jesus being a great miracle worker. Tellingly, we have not found a single ancient manuscript of the Gospels where the story of the feeding of the 5,000 is found apart from the story of Jesus walking on water. Together, these two stories demonstrate that Jesus was quite unlike anyone else. He even exceeded the prophets, who sometimes performed miraculous feedings and healings. However, you don’t find the prophets defying space, time and gravity the way Jesus did in walking on water. To give you the cultural context of this story, we need to understand how the culture of that time viewed the sea. It terrified them! It symbolized all that was dangerous, mysterious, untamed in the world. To them the ocean was like nuclear energy is to us today—something that can be useful, but is unspeakably dangerous. One of the promises in Revelation 21 when the new heavens and new earth are created is that there will be “no more sea.” To the mind of its original readers, this would be a comforting image, whether it means there would be literally no more water or something else. They looked forward to the time there would be no more sea because the sea was chaos and disorder and the ONLY one—the ONLY person who controlled the sea—was God. So, earlier in Matthew, when Jesus calmed the sea by his word, the disciples wouldn’t have reacted with, “That was cool!” They would have jumped to the other side of the boat to get away from him! Who is this guy! What is he doing!!! So we have to see what they saw in their time, in their cultural context. For them, what Jesus did was humanly impossible, so he must be a ghost. This is an emotional time in Jesus’ ministry. His cousin John the Baptist has just been executed by the king. We see Jesus spending time alone more than once, and he seems pretty emotional. 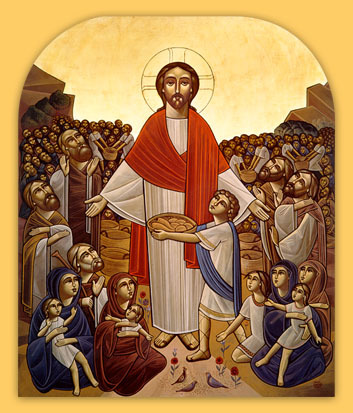 “You give them something to eat!” he says to the disciples. And here he “made” them get into the boat. The original wording is very strong—get in the boat and get out of here! He compels them to get in the boat. Hard to know exactly why Jesus did that. The crowd was pretty unruly, and in Mark it says they were forcibly trying to make Jesus king—the conquering Messiah who will finally lead them to political victory. Who knows, maybe the disciples were taking part in this. Perhaps they wanted to join the riot, stir up the crowd like so many “Messiahs” and revolutionary leaders had done before. Or maybe Jesus was trying to keep them from pride. They’d just been part of a huge miracle, and there was a crowd waiting to adore them. Who can resist that? The moment was theirs and they were in the spotlight. They were ready for the post-game interviews. They were ready to sign some autographs and get some attention. Isn’t that always the temptation? We might be involved in some great work of God or glorify him in some way and the Spirit says to us, “Get out of here! You can’t handle this—and your pride is going to get the best of you!” Come away to where only God is glorified—that is the best reward. Jesus goes away by himself again. I wish we had a recording of his prayer at that time. He is still hurting about his cousin’s death—how could that happen? He’d known John since before they were born, when John jumped within his Aunt Elizabeth’s womb. So here they are on the sea—which they’re already pretty afraid of, and now it’s getting worse. They are at the mercy of whatever spirits control the sea, and the spirits are upset! Suddenly, one of them has broken through! Suddenly, the spirit world is touching their world directly. The spirits are so upset that one of them is now coming across the water toward them! They “cried out in fear.” The Greek word is ekrazo. It’s a word that sounds like what it’s supposed to be—like “splash” or “crunch.” They didn’t sit there saying, “Oh look, there’s a ghost…” No, they ekrazoed! One translator says, they squawked! If you had this experience, you’d be squawking too! In Mark 6:48, Mark writes that Jesus “was about to pass by them.” This small detail says a lot. In Exodus 33, God reveals himself to Moses. He says to him, I will cover you with my hand while I “pass you by.” Thus we have a hint here of who Jesus actually is—of what’s going on. So the disciples are on the sea going nuts! And the sea is so angry with them it’s sent somebody to take them out? Have you ever been walking around in the dark and all those horror movies you shouldn’t have watched back in the 80s come back to haunt you? You’re thinking, Man, I really shouldn’t have watched The Shining so many times in college! Then all of sudden a cat or dog or something jumps out from behind a tree and you have a small heart attack. That’s what we’re talking about here, only it wasn’t a case of mistaken identity. I think of the time my dad was in the hospital. He had a mental breakdown some years ago—had to go on disability and was in the psychiatric unit at the hospital for a while. I had just started seminary and flown home for an emergency trip as we all sat around and worried, trying to figure out what was going on. He called the house one night, raving about something. I answered the phone and let him talk, knowing that it would upset someone else in the family to hear it. I took that into myself in a way, and I felt very alone, very unprotected. Years later, I was reading the biography of a great Christian from this last century—Thomas Merton. He had a story in there about his father having a brain tumor and going in to talk with him. Then his father saying something that made no sense—deep confusion because of his illness. Then this man walked back home and felt very alone, very unprotected. And then there was Peter. The endearing, impulsive one—always the first one to fly off the handle and do something silly or dangerous. Always the first to jump out in faith. This is where the pictures come in. One of the great church fathers suggested in reading Scripture we try to see where we are in the story. Who are we as we read this account? Though Jesus was perhaps far from the boat at the time, Peter boldly cries out to him, “Tell me to come!” Sometimes that’s where we are. We see what looks like an opportunity to be part of God’s kingdom coming into the world. Thirty years ago, Joe Tkach, Sr. saw some places where he would have to admit mistakes and change some ideas—talk about a storm! And to our eternal gratitude, he said, if it’s you, Lord, tell me to come out to you! And he did. Where are you in this part of the story? Are you still in the boat—one of the 11 who held back? Well, not Peter, the crazy one who walks out there and embarrasses himself. As for me, I’m probably watching from the sidelines. Isn’t that where we often end up? We have all kinds of opinions for those who are actually getting the work done, but we’ve never done the work ourselves. I’ve been in that boat before. I watched my friends and both of my siblings get married before I did. I’ve watched people step out and sink and step out and walk on water while I held back and kept safe. So there we are, watching over Peter’s shoulder, watching life and life with God, go by. 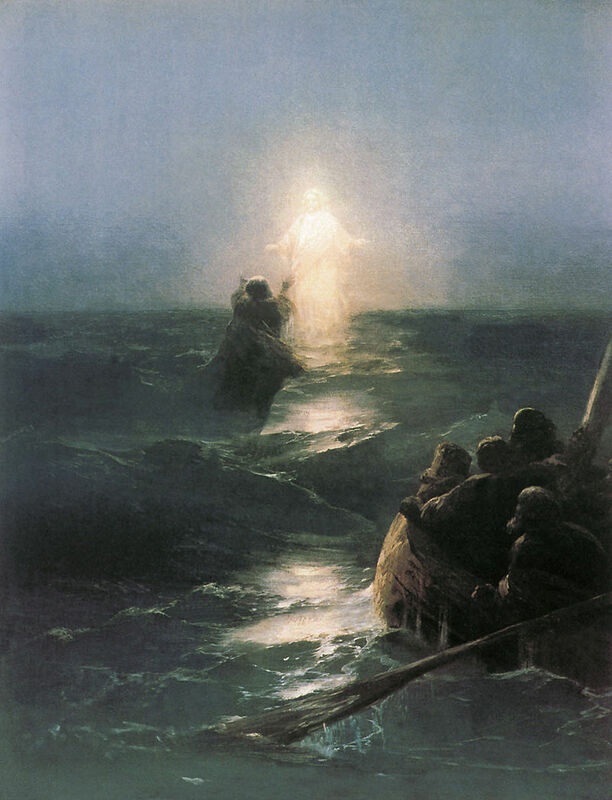 Peter looked away from Jesus—he saw the terrifying wind over the mystery of the sea and lost his faith for a moment. What had been the Lord’s face became his feet and finally he was looking up at Jesus from under him. Have you been there before? God calls you into a different chapter in life, you finally get out of the boat, and then lose your nerve? Here’s one of life’s guarantees: when you take your eyes off Jesus you’re gonna see storms. Peter knew the storms were there. They didn’t suddenly get worse. He just changed his perspective. Instead of focusing on the person he had seen change the weather, he focused on the weather. Don’t we do that as well? God calls us to a different perspective, a different way of acting, and we worry about the details he is taking care of: Well Lord, if I stand up for that ethical choice, what will people think? If I give to that person, will they take advantage of my kindness? Peter falls, then sinks. It’s his worst nightmare. Someone from his culture falling into the sea—at night, no less! Darkness overwhelming him, the freezing cold water, and who knows what is swimming up to meet him? At times like these we might think Jesus has left us. We couldn’t work up enough faith, couldn’t make the grade, and so we’re done, we’re sunk. Sadly, some strains of Christianity believe that if we don’t have enough faith, don’t do enough good works to make God happy, we’ve fallen from grace; lost God’s favor. Is that what happened here to Peter? No, Jesus came to his rescue. Jesus not only knows about the human experience, he created it, lived it and now, by the Spirit, directs it! Jesus knows what we’re going through and knows how to reach us, to rescue us. Here’s a question to ponder: did Peter have the choice not to grab Jesus’ outstretched hand? Could Peter have let himself sink? Well, Matthew’s account of the event says Peter “cried out.” There’s that Greek word again, ekrazo—Peter squawked! No formalities, not complex theology, no grand strategy, just a cry for help. The Greek word translated doubt means literally to be in two minds. “Why did you doubt?” Jesus asks Peter—Why were you in two minds? You were doing so well. Why are you limping after two opinions? Choose to trust me. Matthew doesn’t tell us how Peter got back to the boat. Did Jesus carry him? 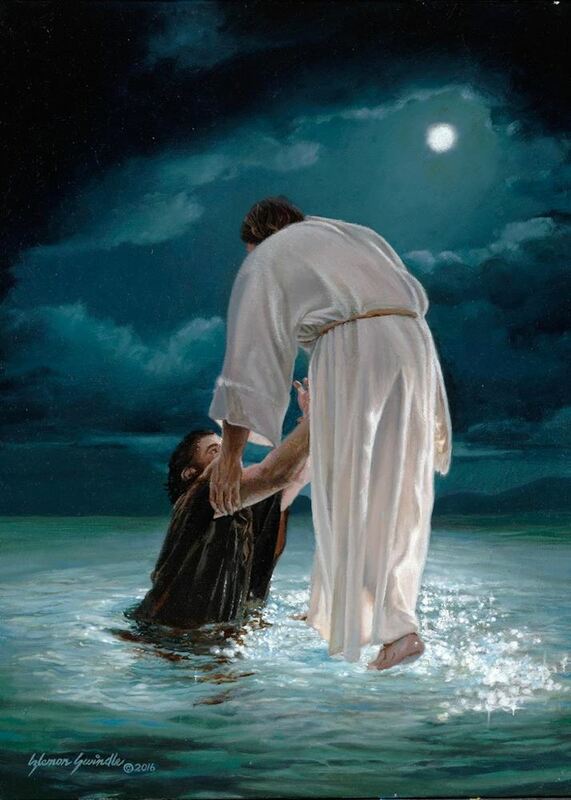 Did Peter start walking on the water again, his confidence in Jesus restored? We aren’t told. Let’s put ourselves back in the story. Where are we? What is our perspective? I started my ministry career working as a hospital chaplain. I remember talking with a mentor years ago when I was starting in chaplaincy. I told her my worst fears of getting a call to the ER for the death of a child. She said, “God has called you here. He will give you the strength for whatever you are called to.” Six years later, I held the hand of a four year old and the hand of his mother as he left this life. I prayed for her to put his little hand in Christ’s. It was one of the tensest moments of my life. I could have stayed in the boat. I could have checked charts or gotten coffee. There were times I did that. But, thankfully, not that time. Have we stepped out on the water? Have you taken a step of faith—walked out into the wind and rain to see how God will walk with you? How he will give you strength? I think of those who are battling addictions. I’ve worked with addicts throughout my career, once at an addiction treatment center and several times in hospital ministry. Addiction is an unbelievable battle—those who are having to trust that God will take care of them rather than caring for themselves in an unhealthy way. It can be a struggle just to make it from bed to the bathroom to the front door, staying on track out of addiction. Most of us have less dramatic examples. Christ may be calling you to reach out to someone in love who you’ve been avoiding. You wonder what will happen—will that person accept my friendship? How will they react? Yes, it may be stormy weather to step out in faith, but don’t turn away. Focus on Christ, let him take care of the details. Are we down in the drink? Yes, you stepped out of the boat onto the water (good for you! ), but seeing the storm, you lost your way. But don’t despair, look up! Jesus is there, reaching out to help you. He is always doing so, you can never go too deep. So change your perspective. Look away from the wind and waves and toward him again. The Bible is the story of God working with humanity, which makes it a story not only of great heroes but of great failures. David—adulterer and murderer though he was—became “a man after God’s own heart.” Abraham—liar and philanderer though he was—became known as “the friend of God.” Paul the violent religious zealot; Peter the bar-fighter; John the confused mystic—all these men stepped out of the boat but fell, then stepped out again and fall again. Not one of them made it to their destination dry! One of the most important things Jesus ever said to Peter—one of the most important moment’s in Peter’s life (and for the church)—is found in the words of Jesus recorded in Matthew 16:18: “I tell you this, you are Peter and upon this Rock I will build my church.” “Peter,” says Jesus, “you are petras” (petras being the Greek word from which we get the word petrified). This impulsive man Peter, who walked out on the water, was the one who told Jesus he would never die, who cut the ear off the soldier in the Garden of Gethsemane, and who denied Jesus three times. He is the one Jesus chose for a unique and important work related to forming and leading the early church, the body of Christ. At times, Peter played the roll of the fool, the court jester, in the story, but he was no loser. Yes, he fell down, and several times at that. 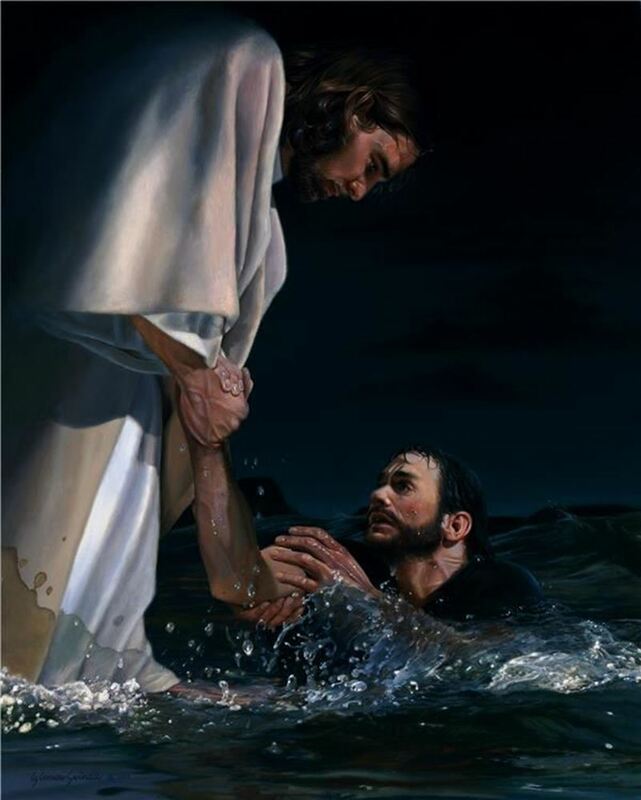 But each time Jesus reached out to him and Peter, trusting Jesus, reached back and was helped up. The losers in this story are those who stayed in the boat and never even tried. What’s our story? Previous Previous post: GCI: We are family!